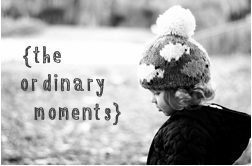 For the first time on this blog, I am joining in with Mummy Daddy Me's The Ordinary Moments. Sometimes, it's hard to remember to enjoy those ordinary, everyday things and focus on the big things, like holidays and treats etc. But every day, especially as a parent, is special. Children are always doing funny things and making us smile. Charlie loves swings now he's a bit older. We have one in the garden, which (unfortunately!) he can see from the patio doors. He can't yet say 'swing' but he makes a noise which sounds similar and points at it, obviously trying to say he wants to go on it.We have to shut the curtains sometimes as he gets a bit obsessed and then starts screaming if we don't take him out on it. He doesn't understand that it's peeing down and we will get drenched! As a parent there are good days and bad days. At the moment, we are unfortunately having more of the bad days as Charlie is going through a funny phase; he won't eat his dinner and he won't go to bed or stay asleep. When we pick him up at 4pm he tends to cry on and off until he finally goes to bed at god knows what time. The last few weeks have been tense and stressful, we're running off little sleep and I feel like he doesn't enjoy being with us. I know that's not the case as he is so happy to see us at 4pm, but I just don't want him crying all the time in the evening. I really hope it's just a phase and perhaps he's getting more teeth.